PRESS RELEASE - On March 21, 2017, we invite you to have a taste of France by sharing a French meal as part of Goût de France/Good France! 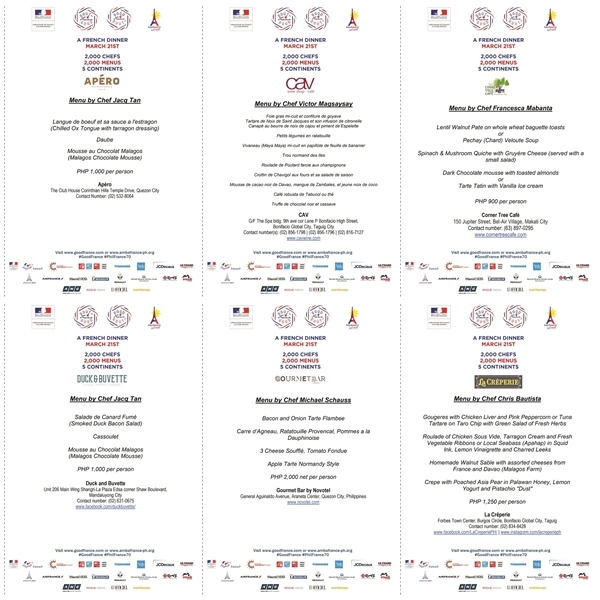 This year’s edition of Goût de France also highlights the presence of culinary training schools. The French Embassy welcomes the participation of two schools in the Philippines: Restaurant 101 of Enderun Colleges and Vatel Restaurant Manila of the De La Salle-College of Saint Benilde. 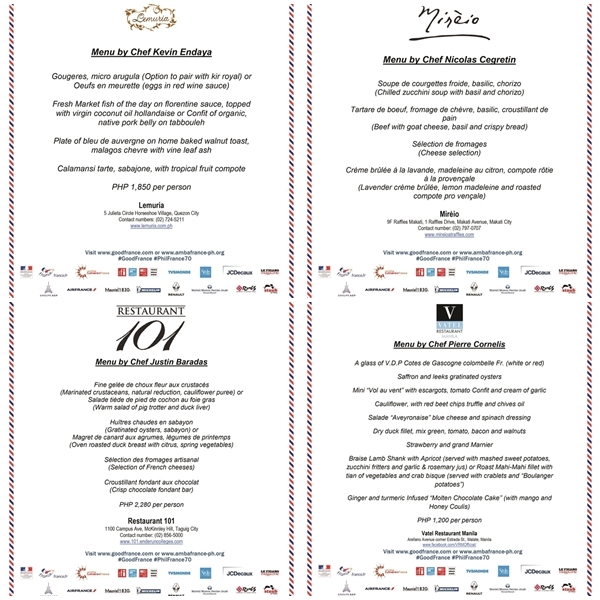 Vatel Restaurant Manila’s executive chef, Pierre Cornelis, has been invited to prepare the special dinner to be offered by French Ambassador Thierry Mathou at his residence on March 21, 2017. (L-R): Chef Justin Baradas of Restaurant 101, Chef Pierre Cornelis of Vatel Restaurant Manila, Chef Nicolas Cegretin of Mireio, Novotel Manila Araneta Center Marketing Manager Michael Sagaran, Apero and Duck & Buvette Operations Manager Kevin Hoffert, French Ambassador Thierry Mathou, Chef Victor Magsaysay of Cav, La Creperie Bonifacio Global City Area Manager Miguel Mejia, Chef Kevin Endaya of Lemuria, Corner Tree Cafe owner Chiqui Mabanta, and Dean Angelo Locsin of the School of Hotel, Restaurant and Institution Management of the De La Salle-College of Saint Benilde. 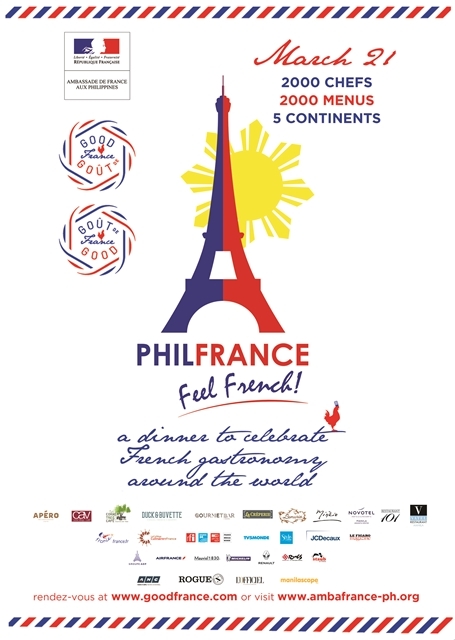 For more information visit www.goodfrance.com, www.ambafrance-ph.org or the Embassy of France to the Philippines and Micronesia on Facebook. Use the hashtags #GoodFrance #PhilFrance70 on your social media posts.